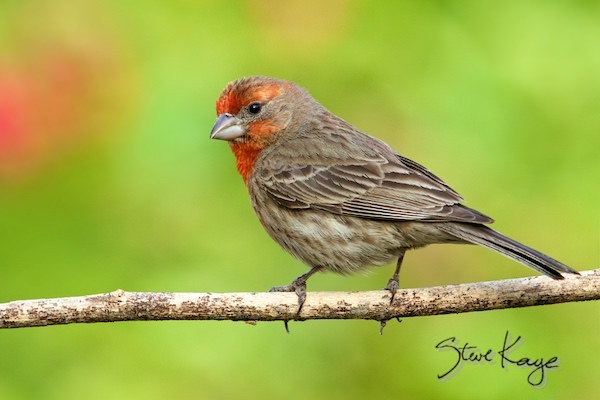 This began as a challenge (what to do with a month of cloudy mornings), evolved into a solution (take photos at home), and produced a result (a photo article about the House Finch – See the link below). I could simply walk outside to take photos for brief periods of clear sky, rather than use that time driving to a park. Any photo is better than no photo. Now I could work on technique, striving to capture sharp feather detail. I could experiment with creative ways to photograph a plain brown bird. 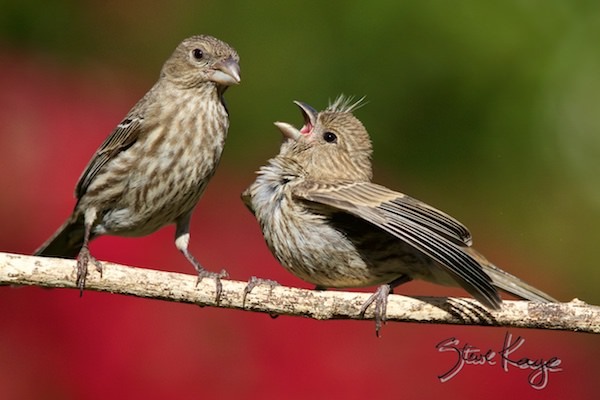 I was able to take photos of: a) Male House Finches with different shades of color, b) Juveniles being fed, and c) Birds showing implied personalities through their pose, posture, and head angle. While waiting, I could relax by immersing myself into the serenity of Nature. There’s an important point here. These challenges test our commitment, our creativity, and our passion. So we need to think our way toward solutions. Because that’s where we make a difference. I’m enjoying two wonderful books about birds. a Kelda 420-800mm F/8.3-16 Telephoto Manual Zoom Lense foe Sony NEX E-Mount AQ1M for $110 including S&H.- from China which now makes many of the Japanese lenses. At that price it is worth trying. I will try it on my Sony A66 and Sony comcorder NEX 30. Will post the results later. 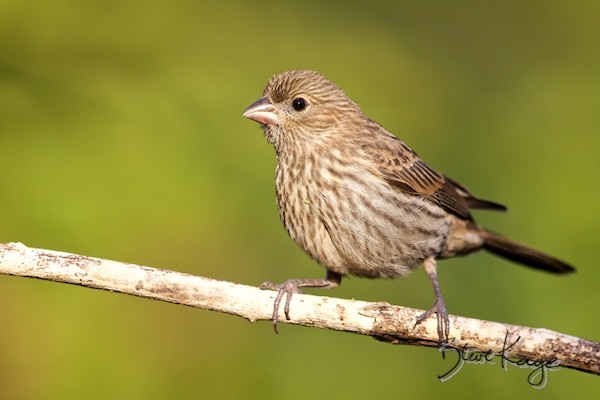 I wasn’t a big fan of House Finches – until now. Thanks. Wow, you manage to capture the most stunning detail of these wonderful birds (and all birds). And it’s obvious you are have incredible patience to wait for the “perfect moment” to snap a photo. Absolutely love your work Steve and thank you for your dedication in helping our feathered friends survive on our planet. I get a ton of different Finches on my backyard seed feeder, along with a handful of Doves that forage beneath it. I don’t have any particular favorites, and like just about all birds, regardless. Their high speed lifestyle is so much fun to watch that it makes the expense and hassle of buying bulk seed worth all the effort. Having tried–and failed–last week to capture a couple of small brown birds on my iPhone camera so I could go home and try to identify them, I’m ever more impressed with the patience and skill it takes to get such incredibly clear shots of creatures who flit and move constantly. Your pages are ever a wonder, Steve.